Man! Who is that cool cat? Dude. That's a dog. A dog in a Hawaiian shirt. And that cool dog's shirt is from Hammacher Schlemmer. Not many dogs get their clothes at Hammacher Schlemmer. Shoot, they can't even say Hammacher Schlemmer. 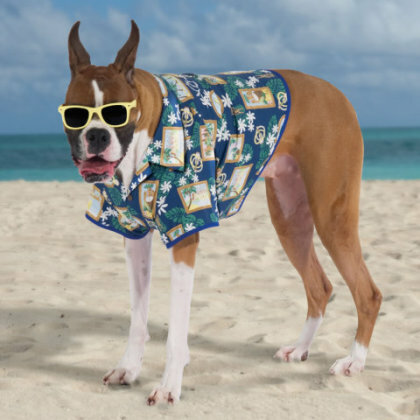 No, but that's some fine Canine Hawaiian Shirt for a dude dog. It's all cotton and it's got a front pocket and special seashell buttons. It's got a classic Hawaiian print too, not some tourist print. Just like the favorite shirts of real Hawaiian laid-back business men. Oh yeah? Well, that's cool. He's a cool cat.